Discussion in 'Vegas Trip Reports' started by IHeartDancers, Jun 16, 2017. My TR’s are usually pretty long and I try to make them picture heavy to keep the audience occupied. I’ll be using IG to post up food pics, and put some pictures/video content in my feed and who knows maybe even do a couple of live streams! I’ll be using SC to try and capture the moments, they disappear within 24 hours, so be sure to follow along! I don’t know why but I tend to give preference to SC > IG. (I’m hoping that I don’t catch a severe case of ADHD (ohhh flashing lights!!!!) as soon as I land and forget to post for you guys). Every time I go, I always have this huge “to-do list”, they’re not even hard things to complete but I only end up completing about half of them. That’s it for now folks, thanks for reading! Wheels down in (See Countdown Timer) hours! Looks like fun and a lot planned, hope you get at least half of them done! I also have a list that I hope I can get through, the planning is half (okay maybe not half) the fun. Looking forward to the read....good luck & enjoy! Hope you have a blast and lots of luck... and hope you're able to keep the report going! So my countdown timer was wrong but I didn't know how to fix it. I land in LAS at 3PM. 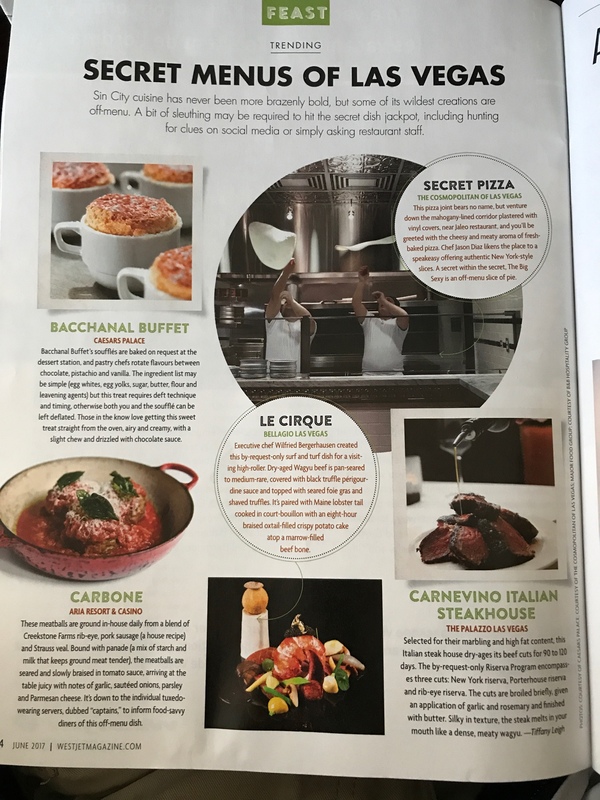 But here's a pic telling us about Vegas Secret Menus from an inflight magazine. I gotta admit, I knew about none of them. The timers are a bit tricky, even when you pick your time zone, in my experience they don't reflect the right hours. I usually go on Google to find out how long it will be exactly till vacation day and manipulate the timer until I get close enough. And to answer a couple of your questions, every scratchoff at MSS is a winner. Minimum $2 for quarters+, and $1 for nickels/dimes. And yes all the Cosmo bars have the ticket system. But also your first drink is covered by your $20 buy-in. The ticket system at Cosmo has mixed reviews, some say more tickets print than they will ever use, some just hate ticket systems. That said, the bar is nice and the bartenders are attentive to your needs. Finally got free wifi! I ain't paying QQQQ $8.99 for their wifi. 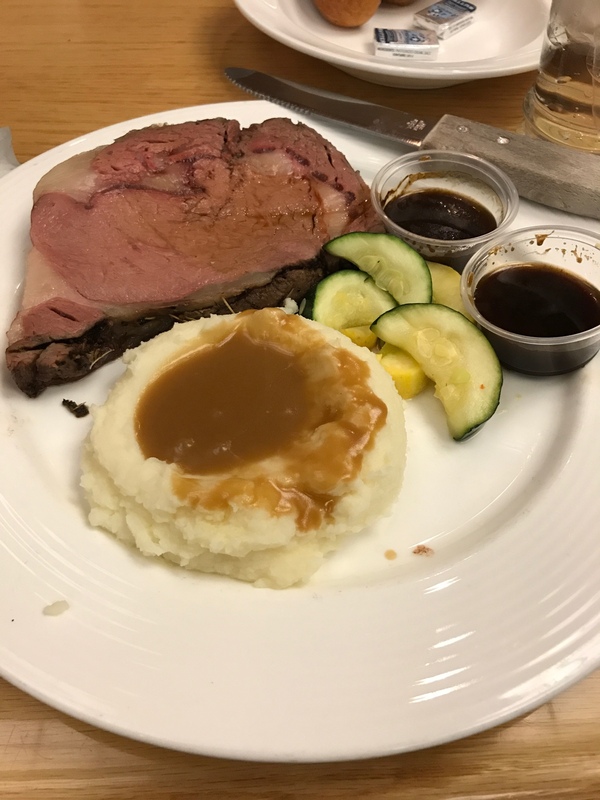 Had the Prime Rib special, used 3 BoGo coupons for 7 people. Meal only came out to $80. That lake of gravy in post #12 looks inviting! Sounds very fun - I'll have to try Bacchanal Buffet & the souffles, since I'm thinking of doing the "buffet of buffets" for a day next trip! Will be following along. Only clocked in about 15 mins of VP last night. Took a few quick pics, will upload when I have a stronger connection. Slight change of plan, headed to the Grand Canyon today, will once again, be lacking on the updates. My snapchat is pretty lit though right folks?